The UCLA full-time MBA program at the Anderson School of Management offers a superior management education in a dynamic and intellectually stimulating environment that prepares graduates to enter the global economy as effective leaders, planners, and managers. There is one intake of students per year who begin classes in the fall semester. During the course of the program, students are given the option of participating in an international exchange program. Upon arrival on campus, students build their capacity for leadership in the Leadership Foundations course, completed during Orientation. In this class students assess their leadership strengths and limitations and then develop a plan for improvement. During the Orientation period, first year students also take Accounting and Organizational Behavior to solidify the basic skills and principles that they will build on for the next two years. The UCLA full-time MBA consists of an aggregate of 90 units of coursework to complete the program. All MBA students are required to complete 36 units of core courses that provide the foundation for graduate business education during their first year. The second half of the program consists of 40 units of elective courses in fifteen possible areas of academic concentration: accounting, corporate finance, easton technology leadership, entertainment, entrepreneurship, global management, investment management, healthcare management, leaders in sustainability, brand management, marketing analytics, executive development, social impact, consulting, and real estate. In addition to this, students will also be required to complete a final project. During the first year, UCLA full-time MBA students complete nine courses in either marketing or finance. In the second year, students will have an opportunity to completely design their own curriculum and focus solely on electives aimed to further understand their specialized area of study. Students participate in a field-study program called Applied Management Research during this time. As a capstone experience of each and every UCLA full-time MBA’s journey, students choose teams of peers to embark on a 20-week project in one of three directions. In the Management Field Study (traditional AMR), students can partner with a top organization to resolve some of the company’s major issues. The Business Creation Option gives students the chance to start their own businesses while still in school. The Special Project Option challenges groups to tackle problematic issues that impact an entire industry. The target class size for the UCLA Anderson MBA program is 360. As of this year, 38 percent of the full-time MBA identified as female and 62 percent identified as male. About 70 percent of matriculated students are U.S. Citizens, while 30 percent identify as international. The average GMAT and GPA earned by students are 715 and 3.5 respectively. On average, students have five years of professional experience when they begin the program. The average age of students enrolled in the MBA programs is 28. UCLA Anderson full-time MBA students have access to career advisors and executives-in-residence who will help with industry and job function overview, career assessment and development, targeting outreach and informational interviews, using the alumni network and other UCLA Anderson resources, resume and cover letter review, mock interviews, job offer evaluation, and negotiations. Throughout the year, workshops and panels occur that feature Parker CMC advisors, second-year students, alumni, and executives. During the first quarter, students can prepare for recruiting season with the Career Series course, taught by Emily Taylor, associate director of MBA Career Education and Parker CMC advisors with the help of the second-year teaching assistants. Hundreds of companies seek out UCLA Anderson MBA graduates by visiting campus, posting jobs, and searching through resumes. Anderson helps students expand their network and grow relationships with these companies, as well as with companies that may not have a large presence on campus. Before graduating, 78.8 percent of students of the most recent graduating class had job offers, and that number increased to 92.4 percent three months after graduation. The cost of books/supplies is estimated at $1,073, the cost of travel $4,652, personal expenses $4,787 and loan fees at $1,233. In total, the accumulated figures amount to $97,110 for out-of-state residents and $95,431 for in-state residents. Merit fellowships are awarded to students based on the strength of their admission application. 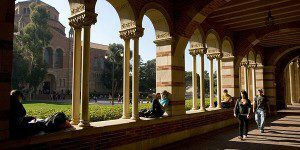 Awards are for a two-year period and are made by the UCLA Anderson Fellowship Committee. Through the generosity of alumni, corporate, foundation, and individual donors, fellowships are awarded based on selection criteria such as professional development, intended career, community involvement, and/or financial need. Students can apply for a limited number of donor fellowships in their second year. Awards are based on first-year grades in the core courses, involvement in the UCLA Anderson community, and other criteria set by the donors. Private agencies and organizations offer a variety of scholarships to MBA students. Most student loans are based on either financial need or creditworthiness and are available only to US citizens and permanent residents. Anderson students commonly use the Federal Stafford Loan Program, and Alternative Education Loans. Private loans may also be available. Applicants to the UCLA full-time MBA program must have completed a Bachelor’s degree from a regionally accredited college or university. While the majority of applicants have full-time work experience, early career and college seniors may still apply. To apply to the UCLA Anderson MBA program, applicants must submit a completed application form college transcripts from degree-granting and non-degree-granting institutions, a current résumé, and one letter of recommendation. The school also requires applicants to complete a personal statement. One optional essay may also be submitted to supply information on extenuating circumstances. Applicants must also send in their GMAT or GRE scores and a nonrefundable $200 application fee. Interviews are conducted on an invitation basis only after submitted applications are reviewed and are required for admittance.